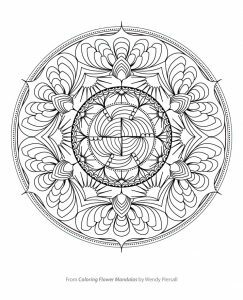 Coloring Flower Mandalas Coloring Book Preview! 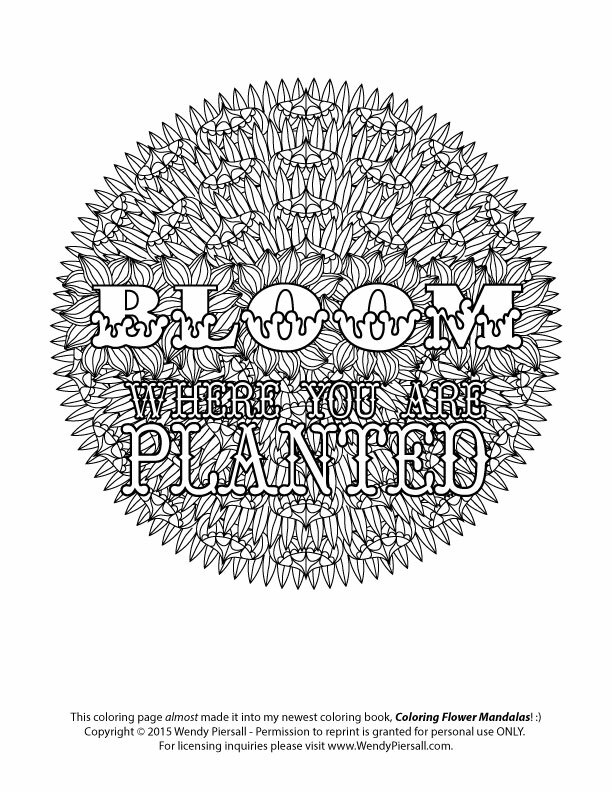 Well, Coloring Flower Mandalas is OFF to the presses! I’ve seen the proofs, seen the cover art in action, and I have to say, Ulysses Press makes me look damn good. 🙂 I’ve been posting a few snapshots here and there of work in progress on Instagram, I just wanted to share some of these with you all in one place! And here’s a free sample coloring page from this book! I know you’re thinking – “Where is the dang book pre-order link, Wendy?” Sorry. I don’t have it yet! When I do I’ll be shouting it from the rooftops, and I’ll update this post with the info. Promise! Here is the pre-order link for Amazon and for Barnes & Noble!!! And if you are near McHenry County, IL, or like to support local bookstores, please order from my hometown bookstore Read Between the Lynes! Edited to add: Here is the video preview, too! Finally, after all the artwork was done, the Ulysses Press editorial team picked the mandala they wanted me to color for the back cover. I couldn’t believe the response it got on Instagram and Facebook – I seriously have the most supportive and kickass friends and fans ANYWHERE! Profound Life Lessons Learned from Making Art for 15 Minutes Every Day Coming Soon! Dream Mandalas & Ocean Mandalas - Two More Adult Coloring Books! I discovered your mandala coloring book on the net,I was interested because of my interest in Buddhism. Love your book Flower Mandalas! How do I show you my finished page? Thanks! Happy to discover your blog. At 75 I’m returning to my younger enjoyment of coloring. The info on pens 7 markers is invaluable. On my way to Barnes & Noble for on of your books. I am so excited!! Hi Wendy. As a new person to this adult passion of coloring, when I googled, “how to color adult coloring books”, I found this site. What I think people (and me) really want to know is the blending techniques that bring a piece to life. I have just started and I do realize that without the blending in certain area’s of your pieces, the results are just flat. I bought some expensive and blendable pencils but I am unsure exactly how to use them and where. Would love your input when you have time. Thanks. Wendy – I too just started coloring again – after about 50 years! I googled the same question as Sharron and got to you! Thanks for your pics! I needed to see what was really missing out of the very few – 2 to be exact – that I have done since Christmas Day. Now at least I see what real artistry looks like and I can head in that direction. I want to make this fun and relaxing, but want to make something beautiful at the same time. Thanks for your pictures and I’ll be back to check on your posts. 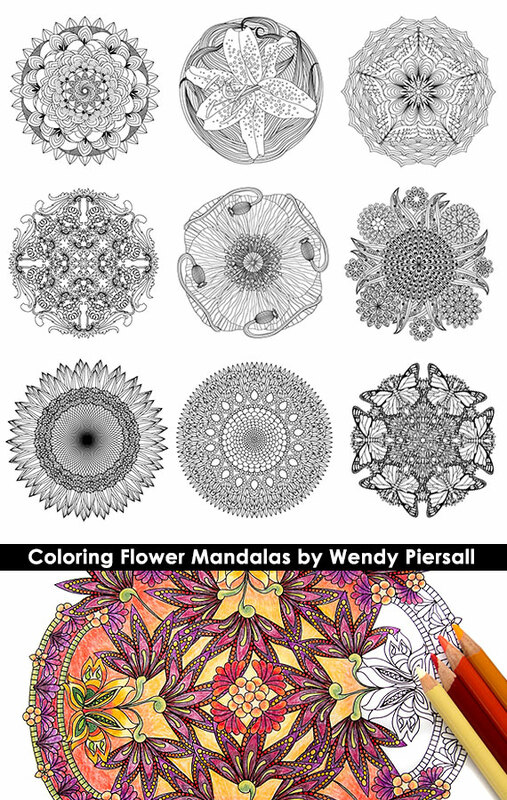 Purchase your new Mandalas Book tonight (Flowers/Animals/Dreams) just finished my first coloring…love it. I am interested in framing some of the pages after I color them, but I am not sure how to cut the page out of the book to do so…I do want a frame with a matting. Any suggestions on how to get the pages out without tearing them up on the edge? Thanks so much. A razor blade should do the trick! I would LOVE to see it! Please post it to my Facebook page here. I love your blog, Wendy. I am a librarian planning coloring programs for teens, I love that you have video clips on you website to show how it’s done. I want the teens to tune into the relaxing/calming aspects of coloring but also to be inspired and creative. How do you choose color palettes? Any suggestions I can pass on to my teens? Also, any recommendations for not so expensive coloring pencils. I’ve tried Crayola and that does not work. Thanks in advance and keep up to good work. I am a very new beginner to these coloring books, which I truly LOVE,..BUT my problem is WHAT and WHERE do I find good, but NOT too expensive coloring pencils….